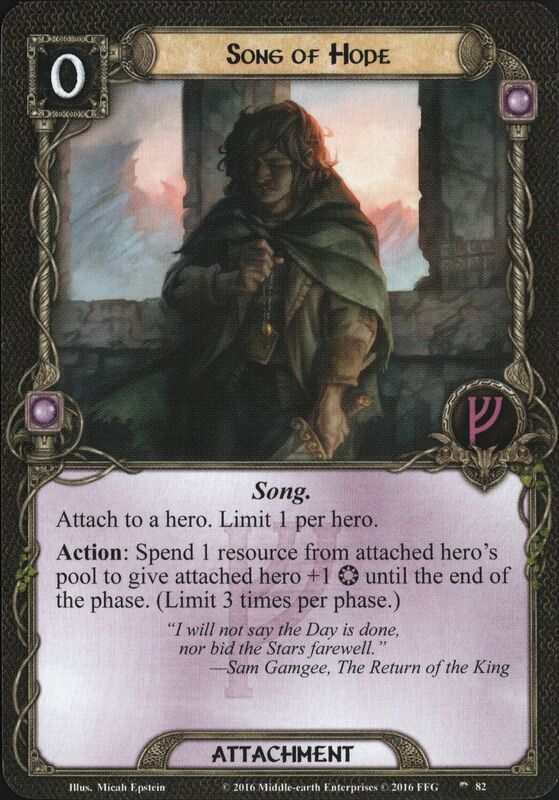 Attach to a Dúnedain character. Limit 1 per character. 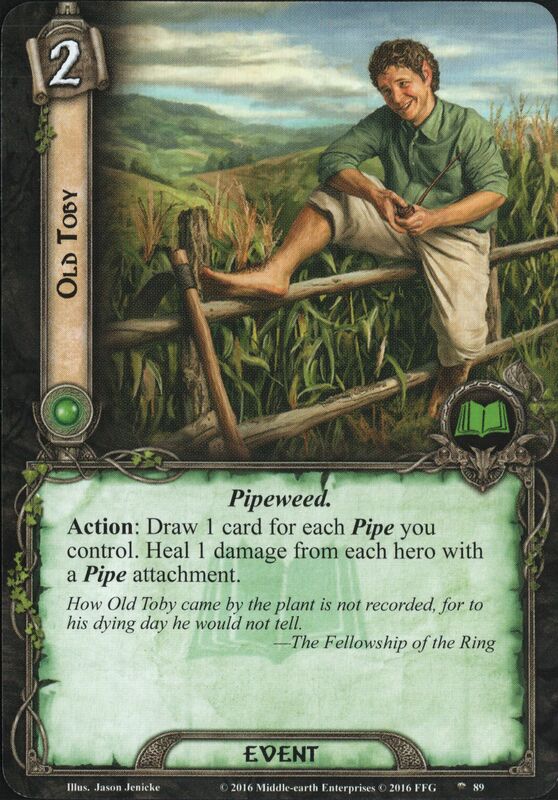 Action: Exhaust Dúnedain Pipe and place a card from your hand on the bottom of your deck to draw a card. 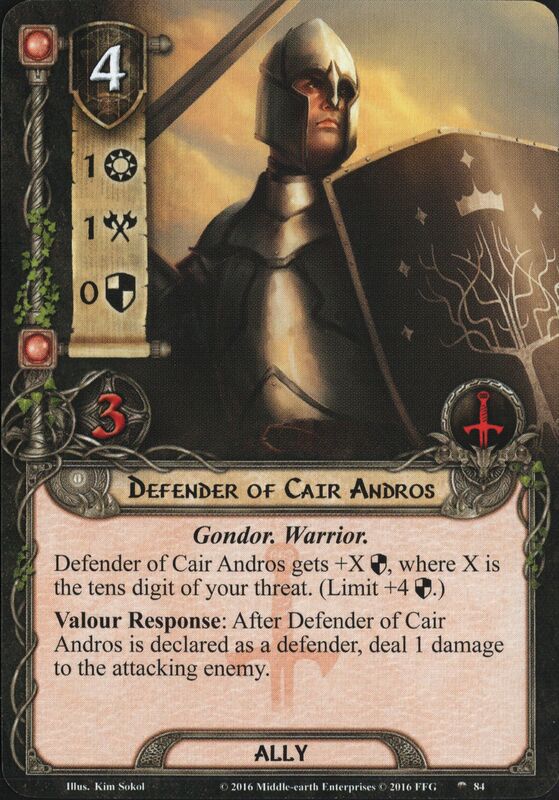 Defender of Cair Andros gets +X Defense, where X is the tens digit of your threat. (Limit +4 Defense.) 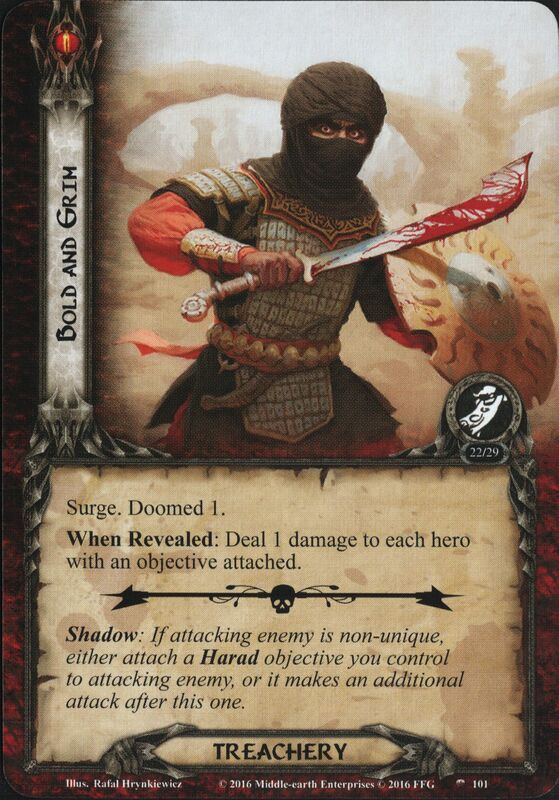 Valour Response: After Defender of Cair Andros is declared as a defender, deal 1 damage to the attacking enemy. 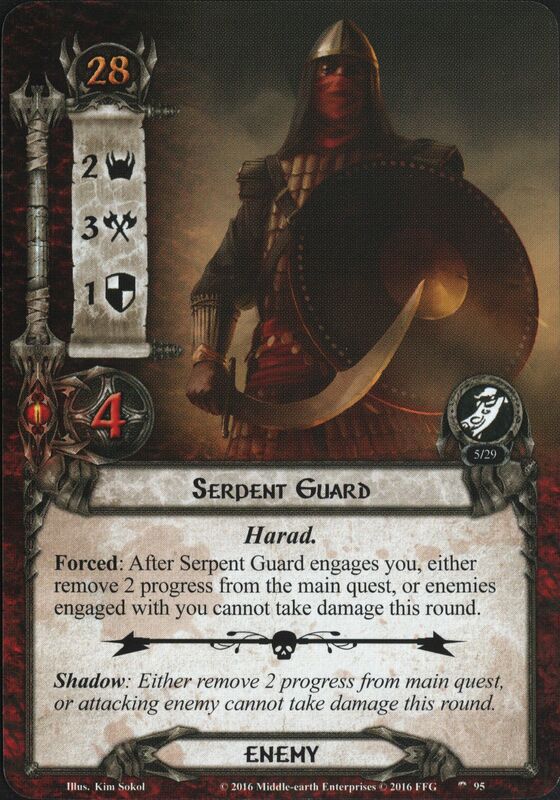 While Banner of the Serpent is attached to an encounter card, each Harad enemy gets +1 Attack. 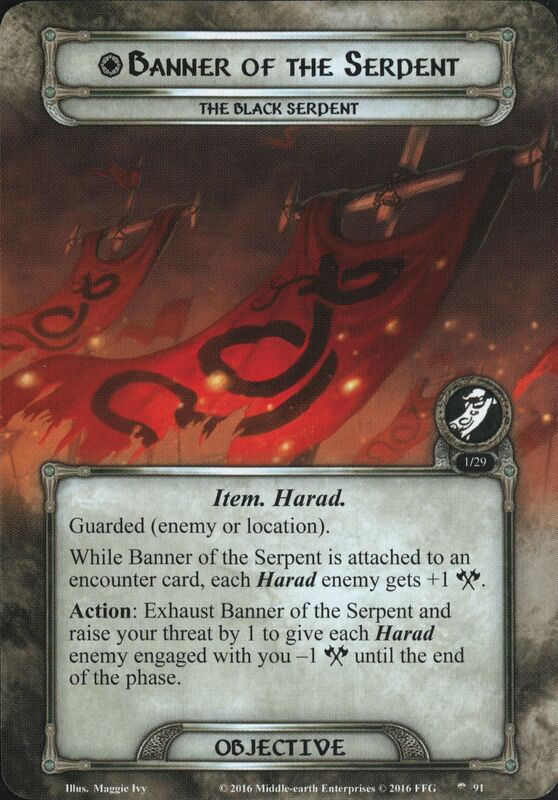 Action: Exhaust Banner of the Serpent and raise your threat by 1 to give each Harad enemy engaged with you -1 Attack until the end of the phase. 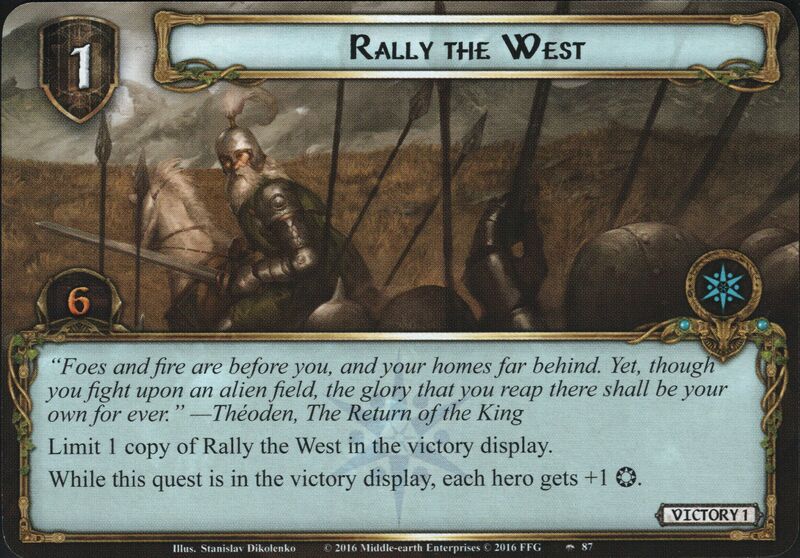 Attached encounter card gets +2 Threat and is immune to player card effects. 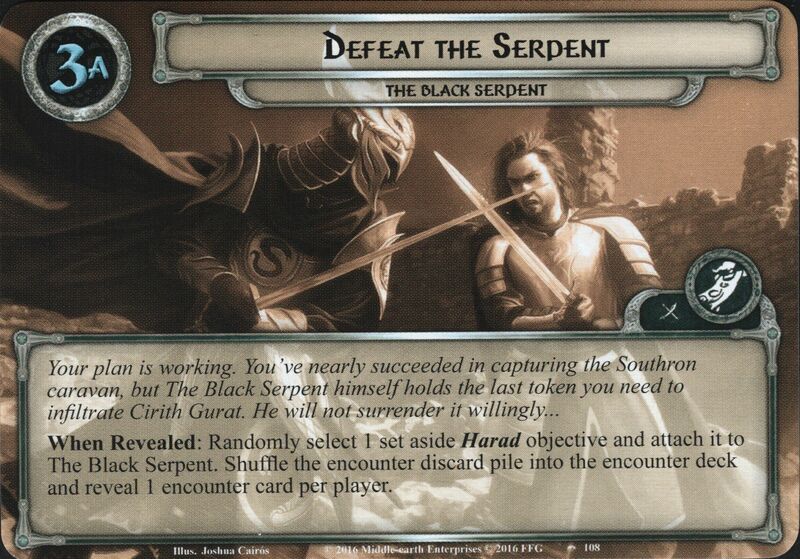 Action: Exhaust The Serpent's Garb and raise your threat by 1 to give a Harad enemy in the staging area -2 Threat until the end of the phase. 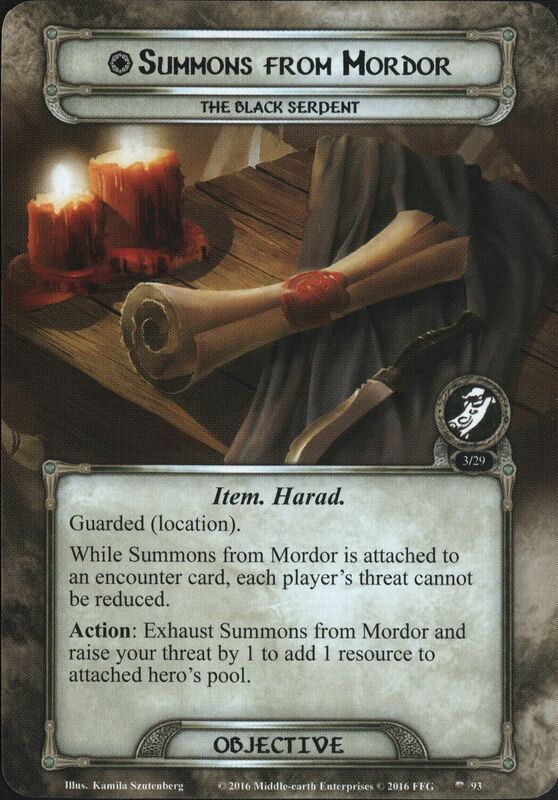 While Summons from Mordor is attached to an encounter card, each player’s threat cannot be reduced. 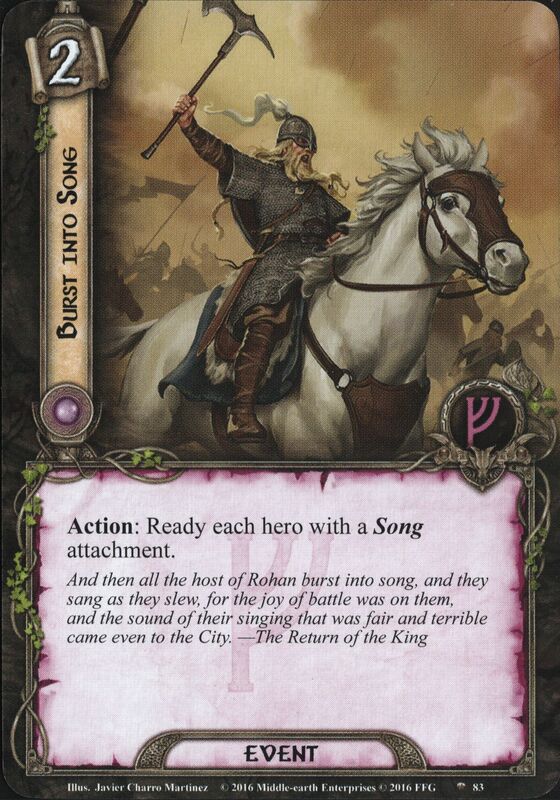 Action: Exhaust Summons from Mordor and raise your threat by 1 to add 1 resource to attached hero's pool. 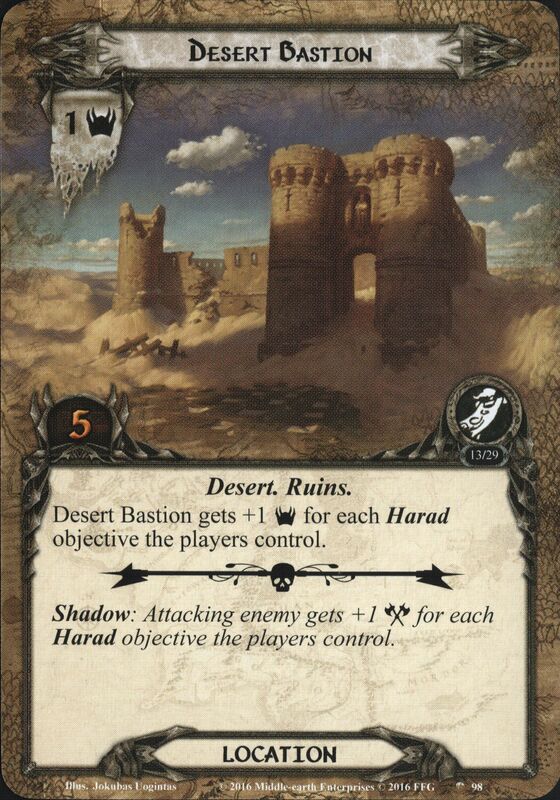 Desert Bastion gets +1 Threat for each Harad objective attached to a hero. 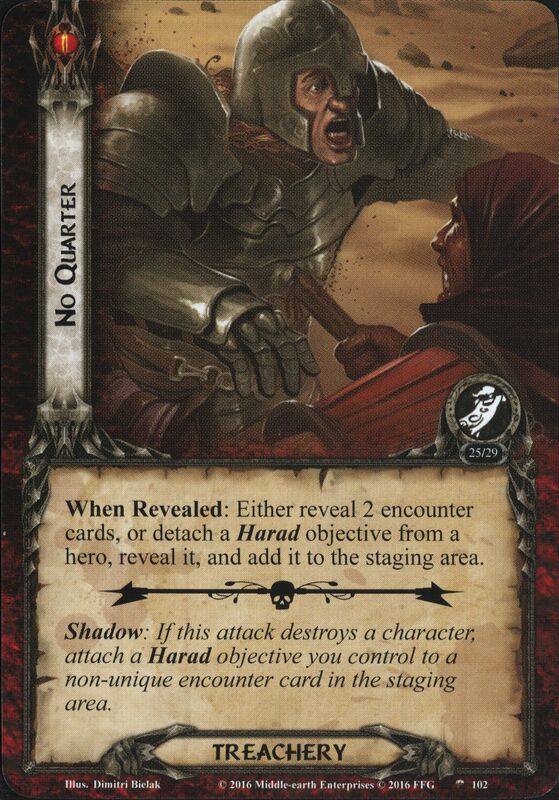 Shadow: Attacking enemy gets +1 Attack for each Harad objective the players control. 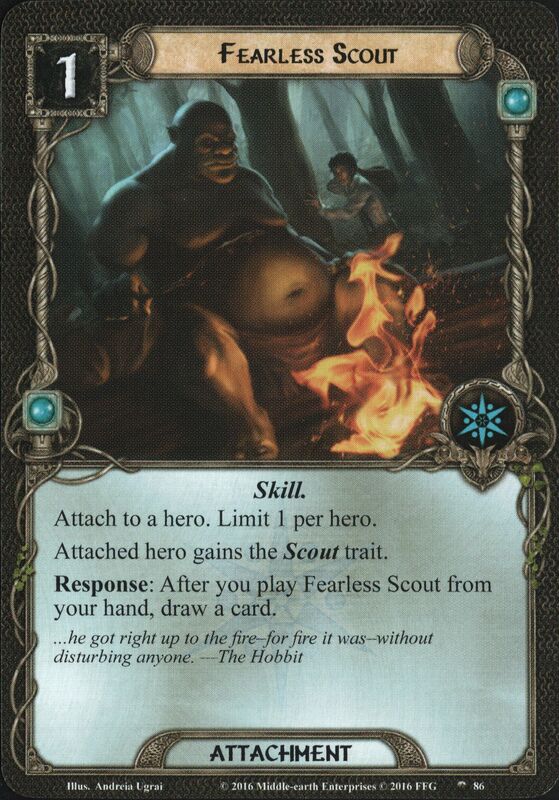 When Revealed: The first player must choose: either raise each player's threat by 3, or progress cannot be placed on quest cards until the end of the round. 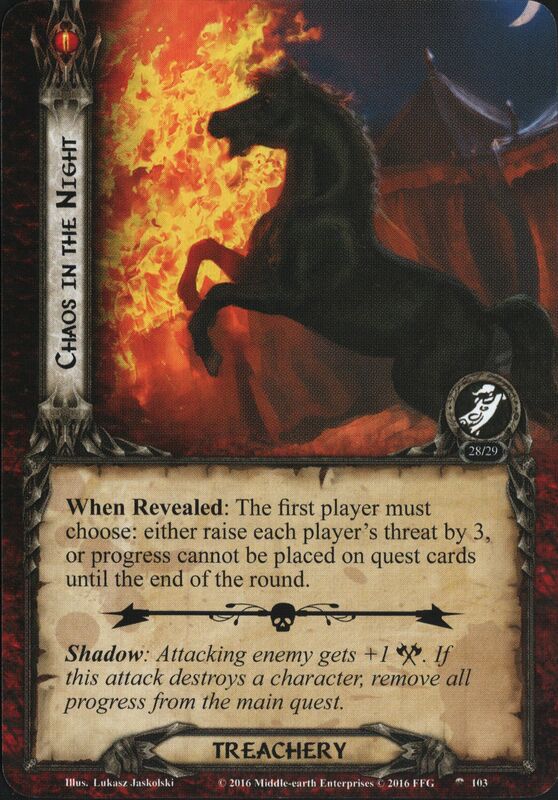 Shadow: Attacking enemy gets +1 Attack. 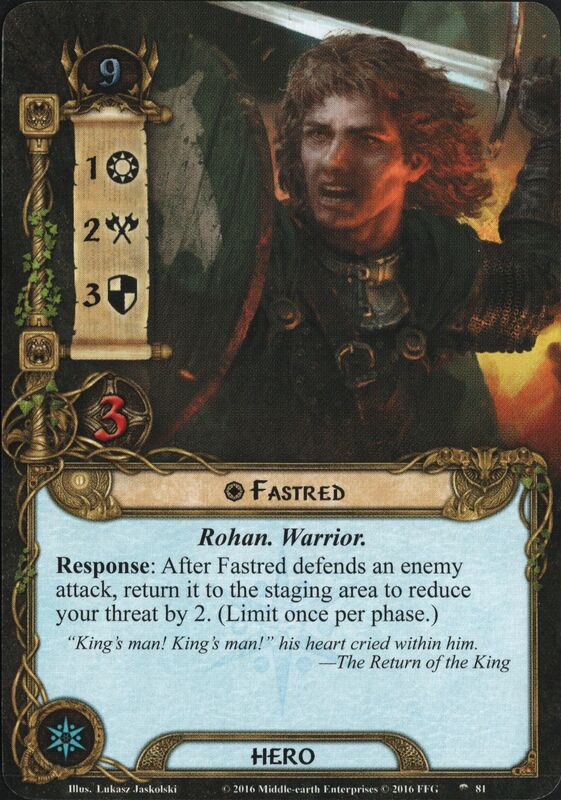 If this attack destroys a character, remove all progress from the main quest. 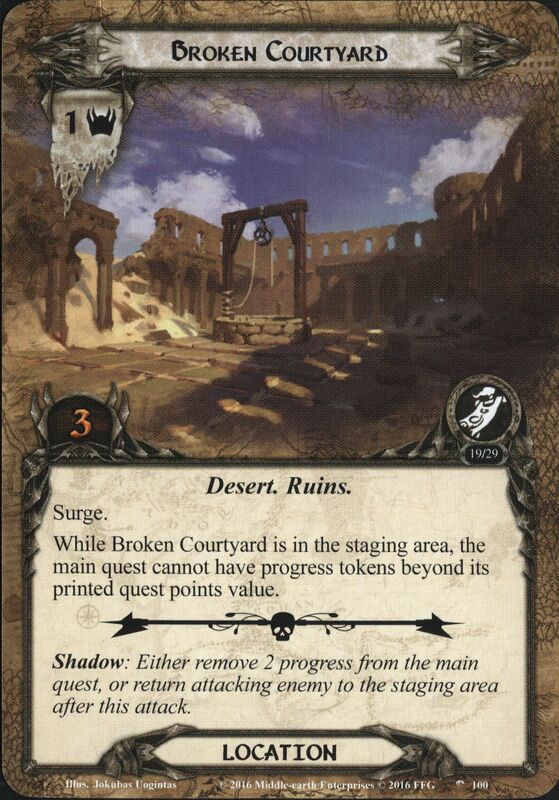 Forced: At the end of the round, discard all progress from the main quest. 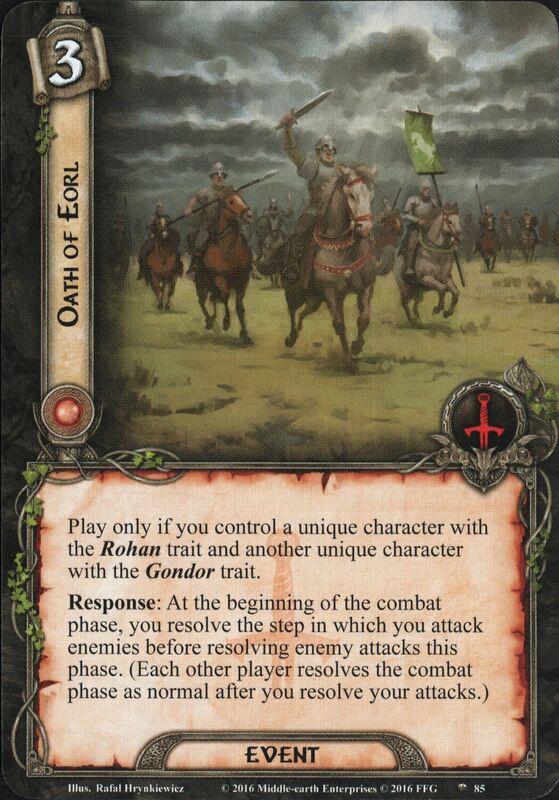 Forced: After this quest is chosen as the current quest, reveal an encounter card. 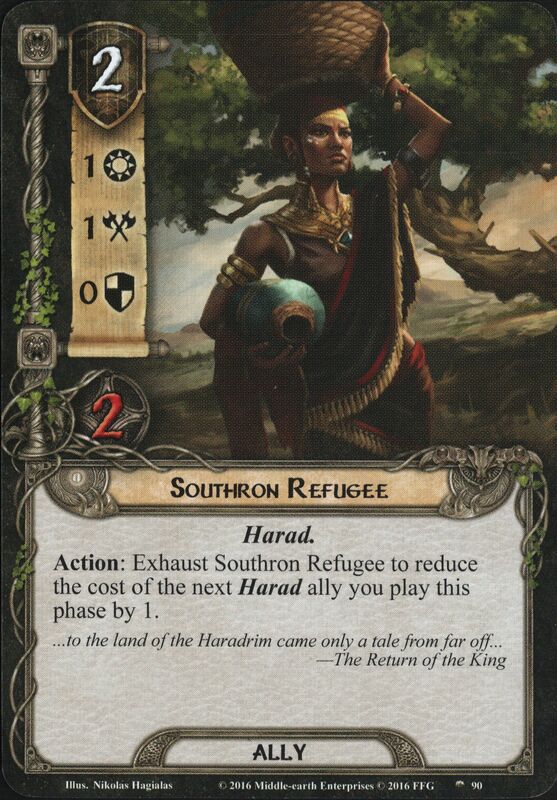 If a Harad objective is not attached, the first player claims it and attaches it to a hero he controls. This stage cannot be defeated unless each Harad objective in play is attached to a hero. 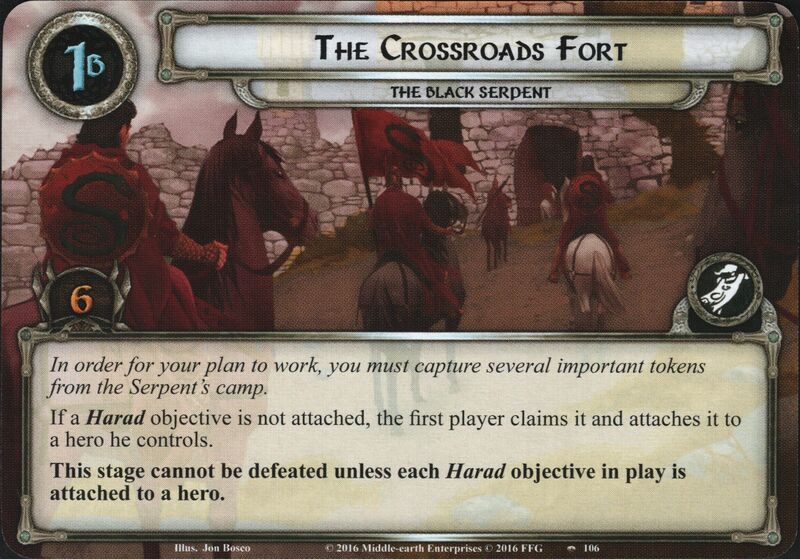 If a Harad objective is not attached, the first player claims it and attaches it to a hero he controls. 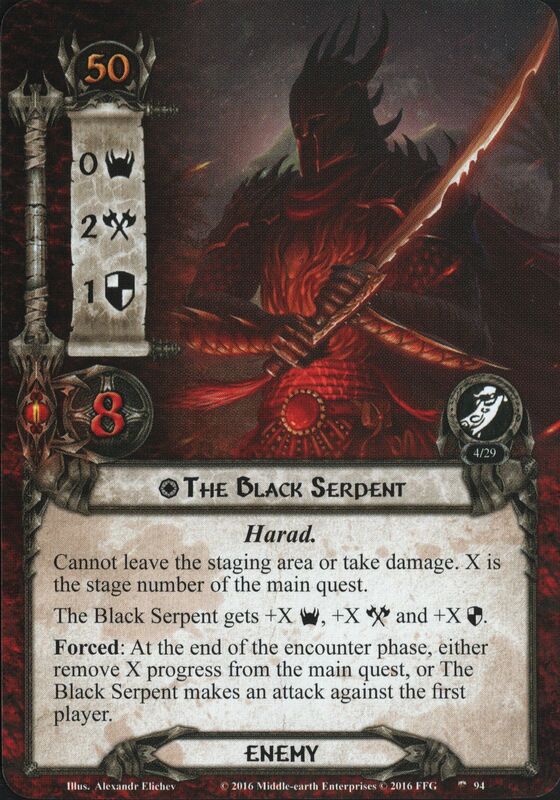 The Black Serpent is considered to be engaged with each player who controls a Harad objective. 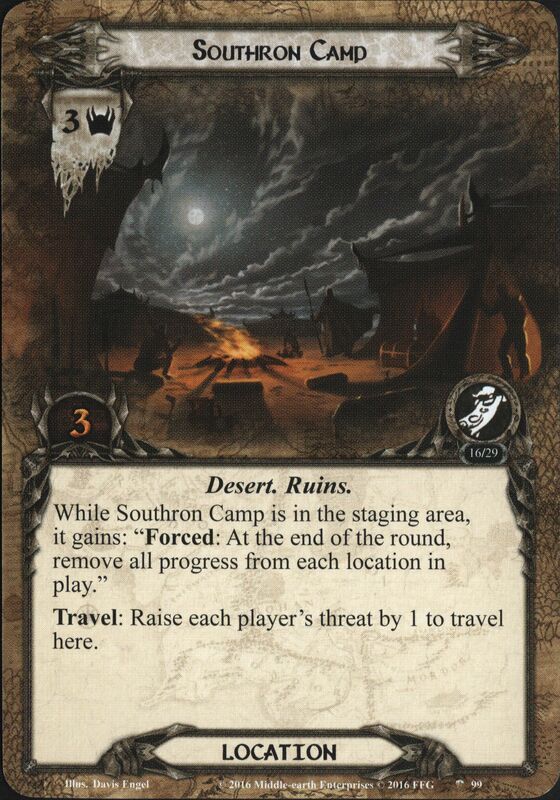 This stage cannot be defeated unless each Harad objective in play is attached to a hero. 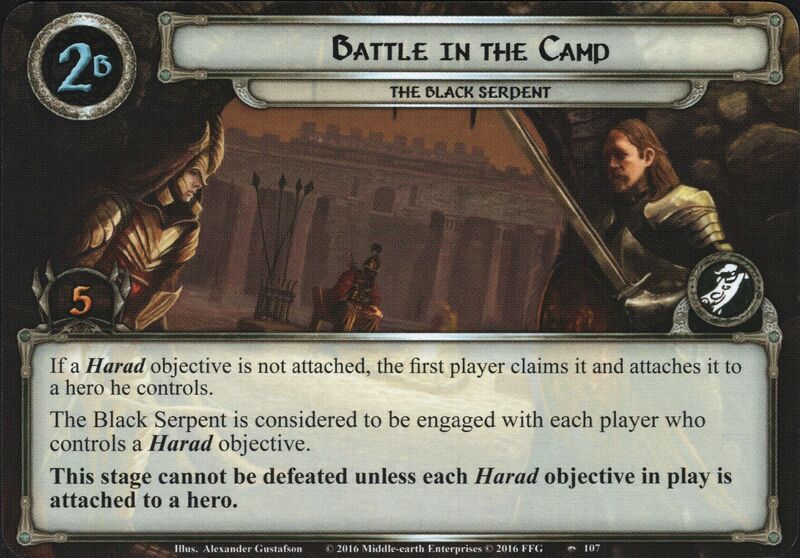 If a Harad objective is not attached, the first player claims it and attaches it to a hero he controls. 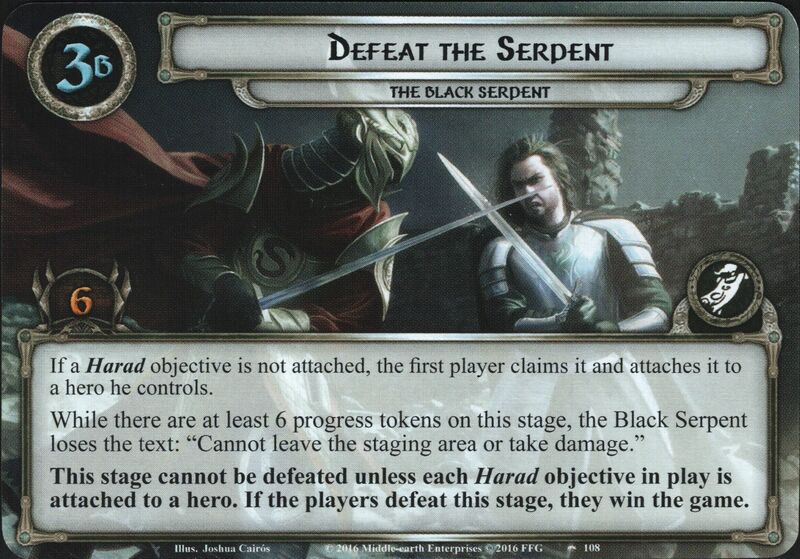 While there are at least 6 progress tokens on this stage, the Black Serpent loses the text: "Cannot leave the staging area or take damage." 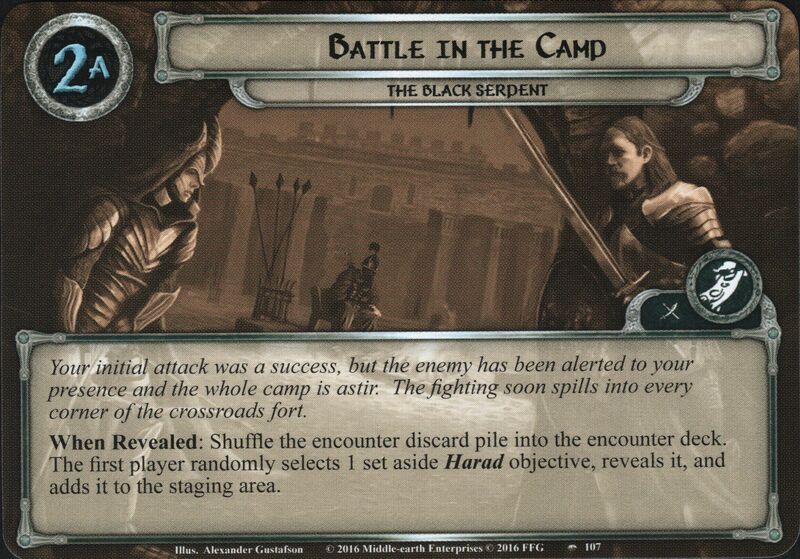 This stage cannot be defeated unless each Harad objective in play is attached to a hero. 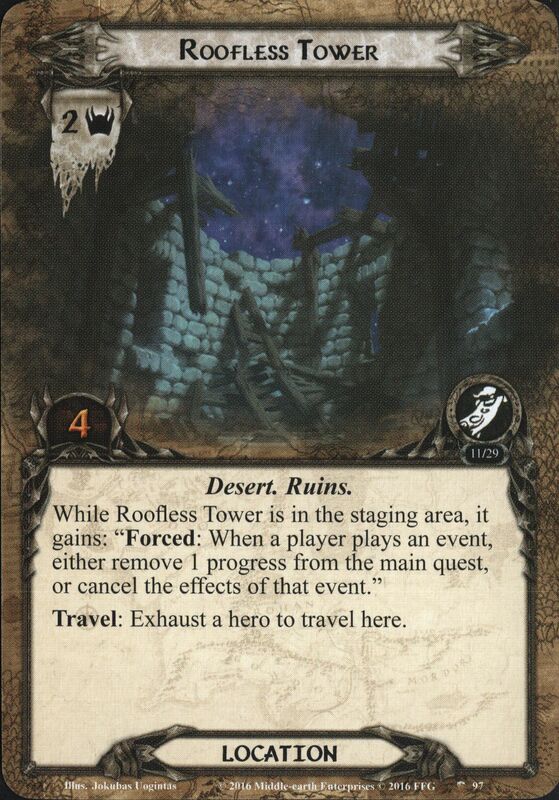 If the players defeat this stage, they win the game.